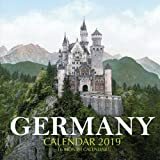 Below are some calendars with pictures of Germany, or German themes. The largest country in Western Europe, Germany is an economic powerhouse. This great nation, however, has much more to offer than just world-class engineering and tasty beer. Charming towns, lovely villages, and magnificent castles dot its stunning and diverse natural landscape. It boasts a number of thriving and elegant cities rich in history and culture. 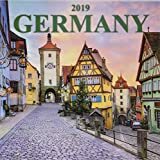 Celebrate and explore glorious Deutschland with this square wall calendar. National Geographic takes a special look at Germany's natural and architectural beauty. NGS explores the country's charming villages, historic castles, beautiful rivers, and great mountains. 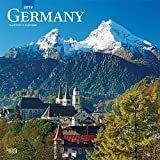 Featured in Germany 2019: Bavarian Alps; Ramsau, Berchtesgaden; Hohenzollern Castle; Sasbachwalden, Baden-Wurttemberg; Quedlinburg Abbey; Berlin Cathedral; Schloss Reinhardtsgrimma, Saxony; Hatzenport, Rhineland-Palatinate; New Town Hall, Hanover; Birnau Pilgrimage Church, Uhldingen-Muhlhofen; Freudenberg, North Rhine-Westphalia; Holderlinturm, Baden=Wurttemberg. Each outstanding image is accompanied by a large grid with moon phases and international holidays. National Geographic supports vital work in conservation, research, exploration, and education. This calendar includes a 3-year at-a-glance page and is earth friendly, printed with soya-based inks on FSC certified paper. 13 x 12 inches (opens to 13 x 24 inches). 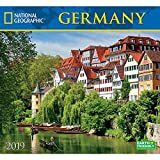 Fill your upcoming 2019, with 16 months of Germany all year round. This beautiful calendar contains 16 months and 3 mini 2018, 2019, and 2020 year calendars. 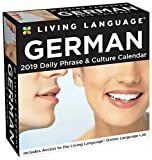 This all-new Living Language: German 2019 Day-to-Day Calendar guides you through the Living Language experience with a new word or phrase each day, alongside its English translation and pronunciation aids. For over 65 years, Living Language® has been a proven and effective language-learning experience. The Living Language approach builds on a foundation of essential words and phrases, developing practical language skills to equip beginners and practiced learners alike. Also included are cultural pages focused on culturally significant events throughout the year for German-speaking people. Plus, you’ll receive access to the Online Language Lab, providing interactive content to help you practice and learn more.